Oh how I look forward to SPRING in Miami as I truly enjoy the amazing weather and the entertainment events during the month of March. My favorite of them all is the "Jazz in the Gardens" music fest that occurs annually to kick off Spring (happening today and tomorrow) that celebrates the diversity of arts and culture. I look forward to a weekend of relaxation and music without the kids each year and the musical artists (both old and new school) that graces the stage. 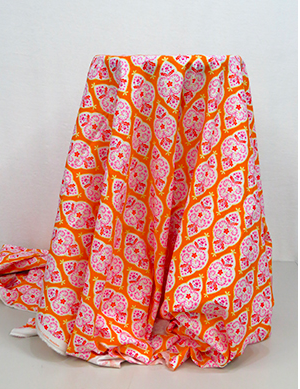 I was so excited to select berry fuchsia linen fabric (here) as my March blog post to wear to the event. Styled with a TANK top and flats. 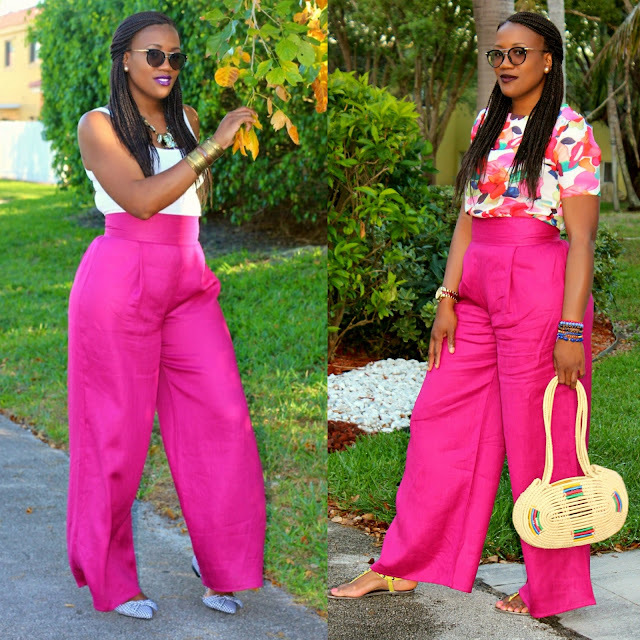 When I came across a few linen looks on PINTEREST, I knew I wanted to create another palazzo pants for my March post just in time for Spring break vacation and the Jazz event. 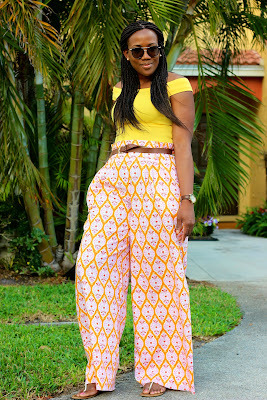 After grabbing some great deal from the PRE-CUT section back in January of this yummy marmalade linen and how amazing the palazzo pants turned out, I knew that I would use linen to create a few looks this Spring. 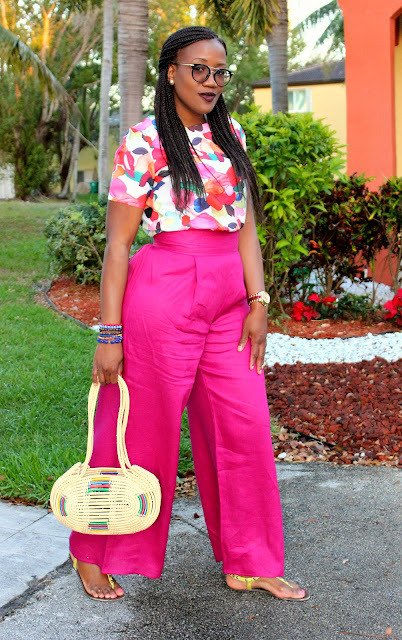 After creating my first linen pants above using Simplicity 8389, I browsed Pinterest for other inspiration and I stumbled across the the perfect high waisted linen wool pants on Moda Operandi Madison and after seeing the price, I was floored. I knew for a fact that I would NEVER spend $1,745 on a pants that I can create for 3% of the price tag. I am in love with my version as it is perfect for my height (5 feet 10 inches) and curves. I did NOT want to create a look that was more fitted at the thighs and hip based on my body type. 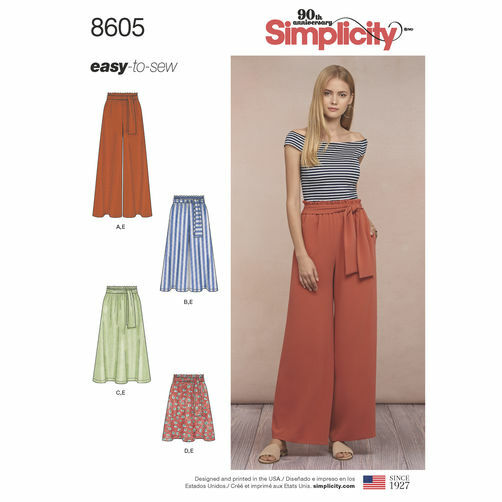 I knew this Simplicity paper bag waist pattern (8605) has room yet drapes perfect and could be used to achieve a similar look. I opted to add a 2-inch knife pleat 5 inches from the front center seam and used a flat waist band with interface instead of the paper bag elastic style. I also gathered the back slightly as I did NOT want to change the pattern and include back darts. I definitely had a few sewing aha moments and will make a few changes for the next pants or shorts that I create using the waistband method. 1. Add darts in the back. 2. Add 5 inches to the length if I plan to wear with heels. 3. Add pockets and remove the side zipper. 4. Include a back center seam invisible zipper all the way to the waistband. 5. Use medium weight facing instead of light featherweight for more stability. For this version, I wanted to wear it with FLATS so I only added 3 inches instead of my normal 5 inches to the length of the pattern. Unfortunately, I had only an extra 1/2 inch for the hem. I am totally in love with linen as it is classic and comes in a variety of colors. The feel is amazing as the fiber is absorbent which makes it cool and comfy. Despite the fact that it crunches easily, it is perfect for Spring or Summer and the beautiful selection here at Fabric Mart are all great options for loose pants, shorts, culottes, jackets and shirt dresses. I can't wait to share my more Spring/Summer makes on my blog and here next month. Thanks for stopping by and don't forget to check out my latest post at Overdrive After 30. 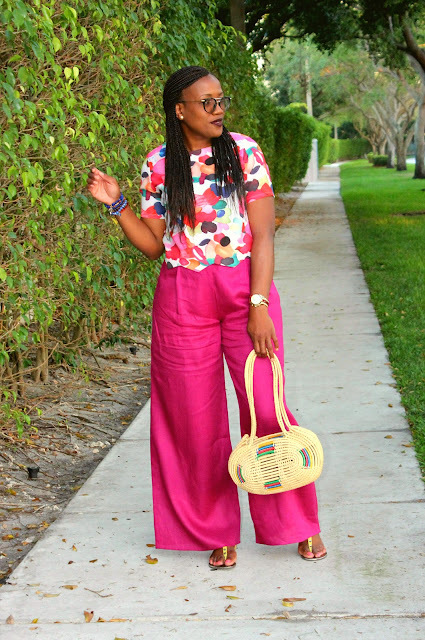 I love your pants, both pair shown in your post. It is refreshing to see something else besides skinny pants, which are not always flattering. Your pants hearken back to the 70's elegance of my young adult days. What awesome pants! Both pairs are gorgeous, but that hot pink pair really pops on you. I love linen too- you can't beat it in the heat! Thanks Ann! Linen is so perfect for those hot days in Florida!